I was born in Brooklyn (before it was hip and groovy). I burned my parents’ kitchen down when I was 12 and didn’t cook again until I got married. I’m married to Michael (and have been since I was a junior in college) and mom to Joshua, the grown man formerly known as “The Kid”. I gave up working on my doctorate in gerontology to bake cookies in a res taurant basement (a job I was fired from) and thank my stars I did. I am the “On Dessert” columnist for The New York Times Magazine (my column debuted in the April 30, 2017 issue). I’ve written 12 cookbooks, the latest is Dorie’s Cookies. The five-course meal will be from her popular recipes and paired with appropriate wines. Single tickets are $95; couple tickets are $180, including all courses, beverages, tax, gratuity. 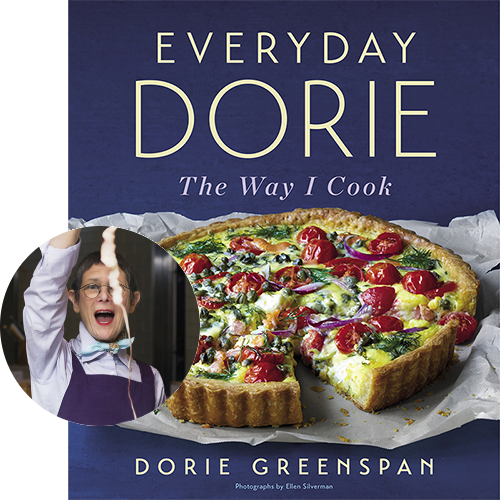 A copy of the Everyday Dorie cookbook (one per individual person/couple) is included in the price. Hors d’oeuvres will be served at 6:30pm with dinner following at 7pm. The cost is $95 for individual tickets, with a $10 discount when purchasing two of the "Couples Discount" tickets. Wines will be paired with every course; the exact vintner to be determined. A copy of, “Everyday Dorie” is included with individual tickets and one shared copy for couples tickets.